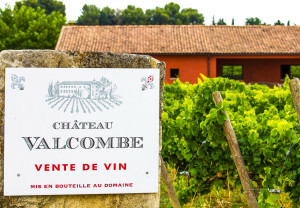 Cloudy day in Provence with a sublime Château Valcombe wine ! Cloudy day in Provence with a fine Valcombe ! This jeep says it all…my kind of place ! Exactly one night of real rain we have had so far here in Vaucluse since 7 weeks. Even the locals say it is “pas normal”. The question is : what shall we do on this cloudy grey Saturday morning ? A great hike perhaps ? 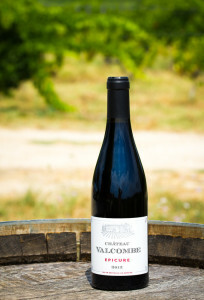 Nah, we were thirsty and not for water but for some excellent red juice…the Valcombe kind ! 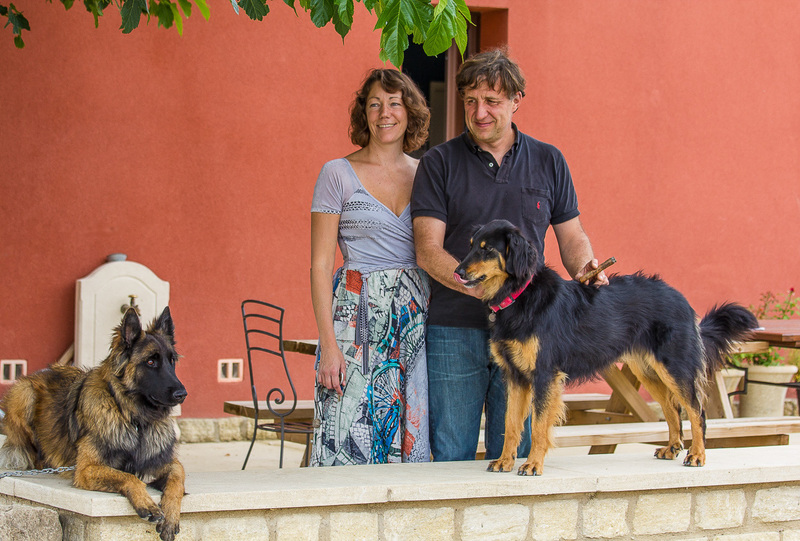 Meet Luc and Cendrine Guénard by clicking on the picture below ! 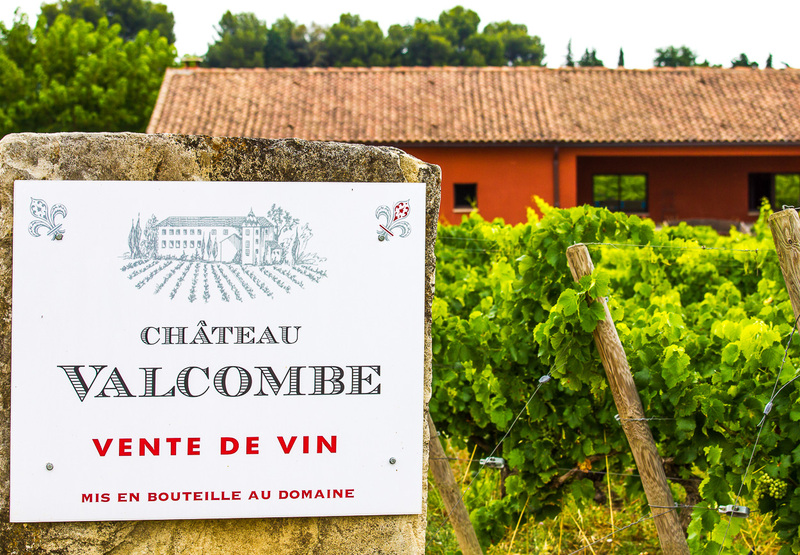 They are the owners of Château Valcombe and proud independent vignerons with a compulsion to further improve this gem of an estate. 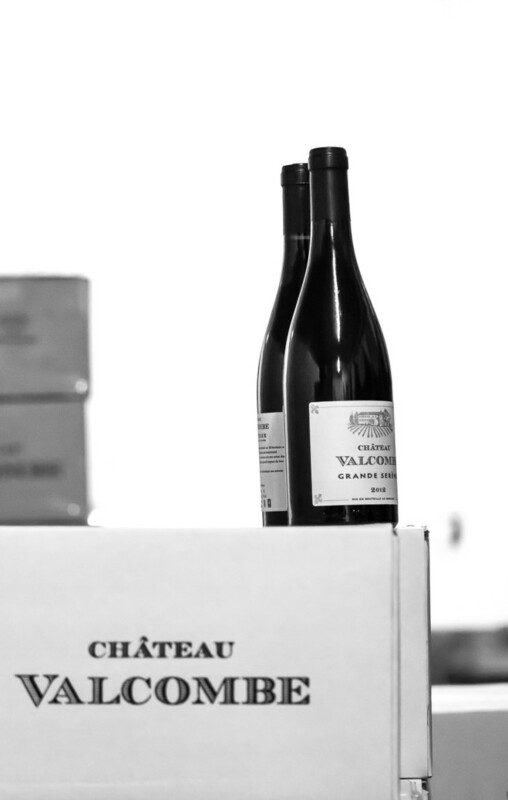 Their first efforts were in the 2009 vintage and we expect them to go a looooooooong way ! They have taken the necessary steps to gain certification as organic growers. They obtained the ‘ECOCERT’ since 2013, which is the organic certification. The vineyards benefit from manual labour without chemicals so that nature and the ecosystem may be preserved. 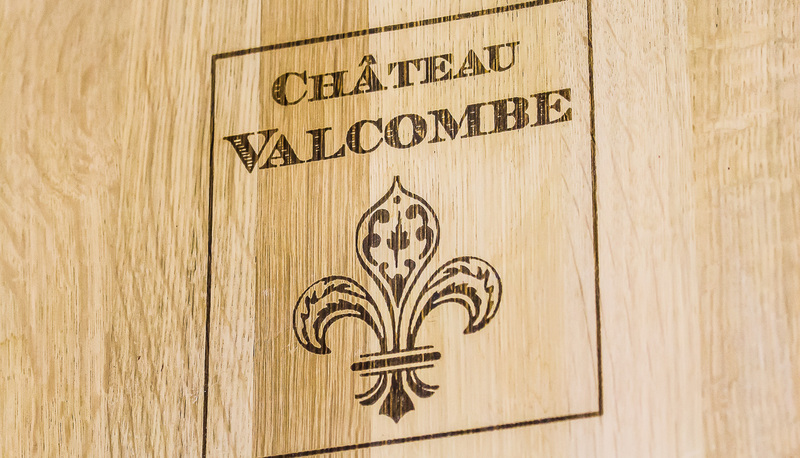 There are 28 hectares of vineyards at Château Valcombe which is situated at an altitude of 300 metres and in the shadow of the Mont Ventoux. 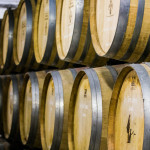 Four red grape varieties (Syrah, Carignan, Grenache and Cinsault) and four white grape varieties (Clairette, Grenache Blanc, Roussanne and Bourboulenc) are planted and the average age of the vines is 50 years, as of 2011. 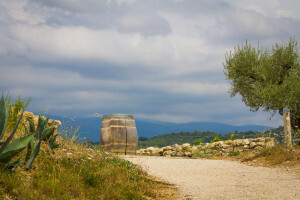 Certain parcels of Carignan and Grenache were planted in 1936, making them 75 years old as of 2011 ! 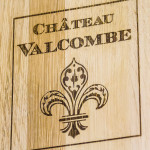 Deep in the subsoil of Valcombe, you will also find the unusual blue-inflected clay (“bleu argile”) that helps define the unique characteristics of the wines of Valcombe. 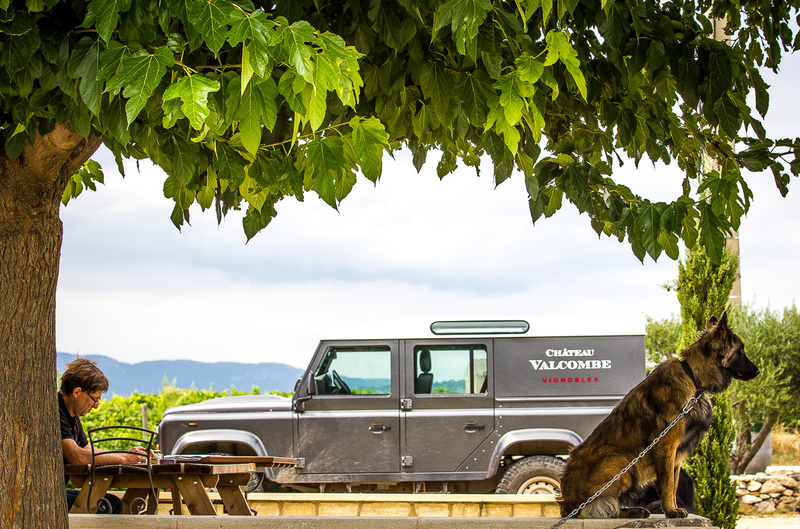 The harvest here is exclusively by hand with a strict sorting occurring in the vineyard. 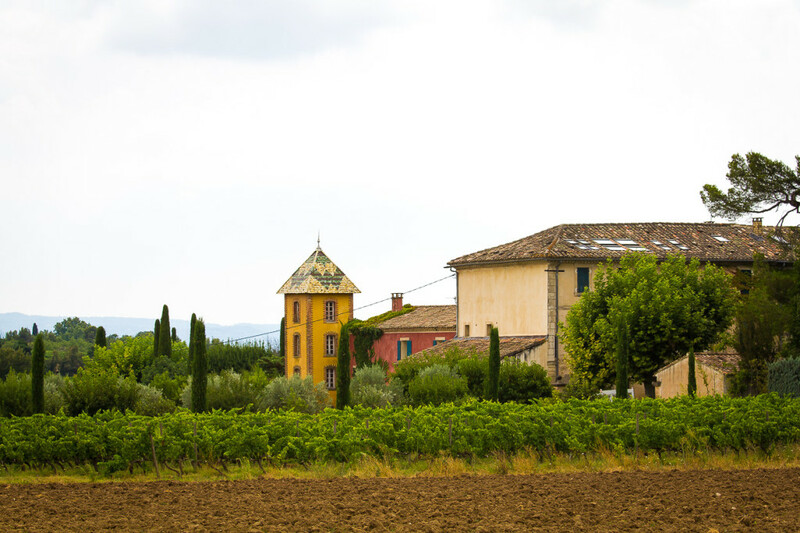 Their well-named Epicure cuvée is sourced in Saint Pierre de Vassols, a little town in the lee of the Dentelles de Montmirail. 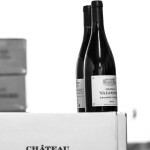 The blend is 60% Grenache, 25% Carignan and 15% Syrah. 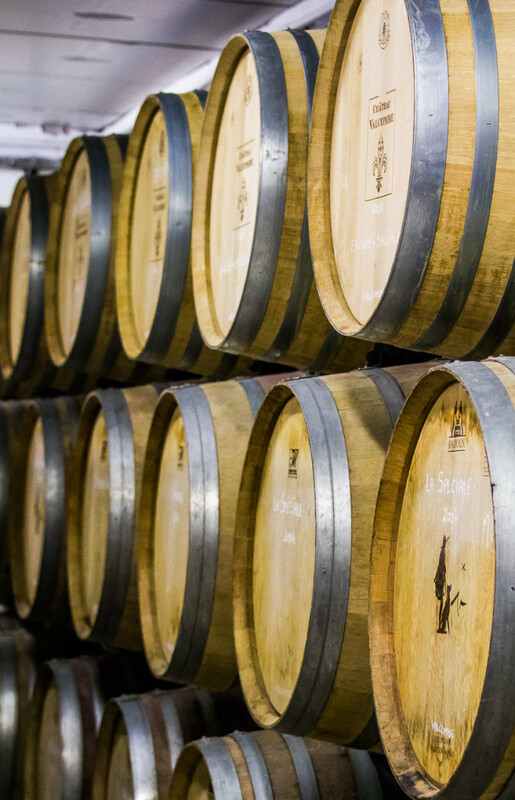 However, these are general guidelines and the blend of each vintage’s ultimate cuvée can vary to a large or small degree depending on that year’s growing conditions. 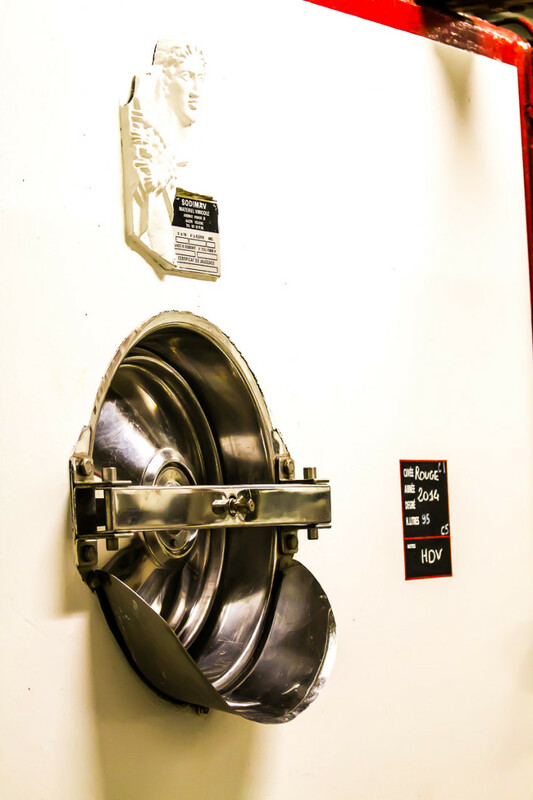 The grapes are destemmed, then are fermented in temperature-controlled cement tanks. 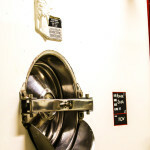 After the initial racking the wine ages in a combination of cement tanks and larger barrels. 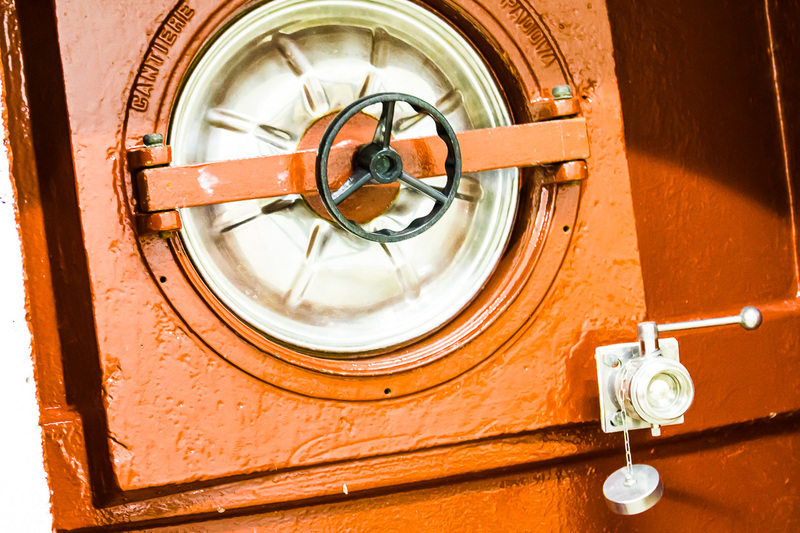 Going down to the caveau is always a fun thing to do, especially with such a relaxing guide as Cendrine. 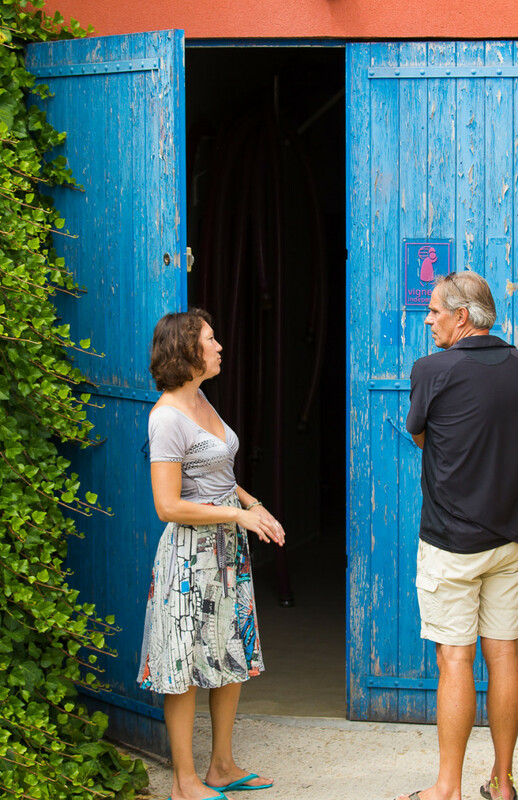 She loves to talk about their work and their wines, the type of customers and the backside and risks of being vineyard owners. Always very interesting…not to mention once you start tasting ! Oh yes, I almost forgot to mention. Did you know that the Valcombe wines are being served at the legendary Belgian restaurant ‘Hof van Cleve’ in Kruishoutem ? It has 3 Michelin stars !!! 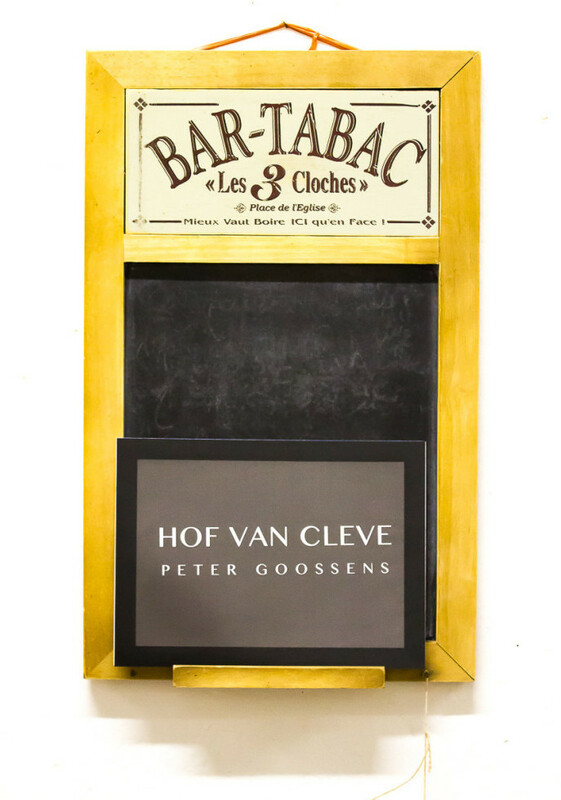 The owner, Mr Peter Goossens, is known as the ‘Godfather’ of Belgian gastronomy…just saying 😉 You can click here to visit their website and make a reservation. Now, I am not a car ‘connaisseur’ but I am sure I can ask one of my Dutch subscibers Fokker Citroën Specialist to write a comment and explain which type of Citroën this is. 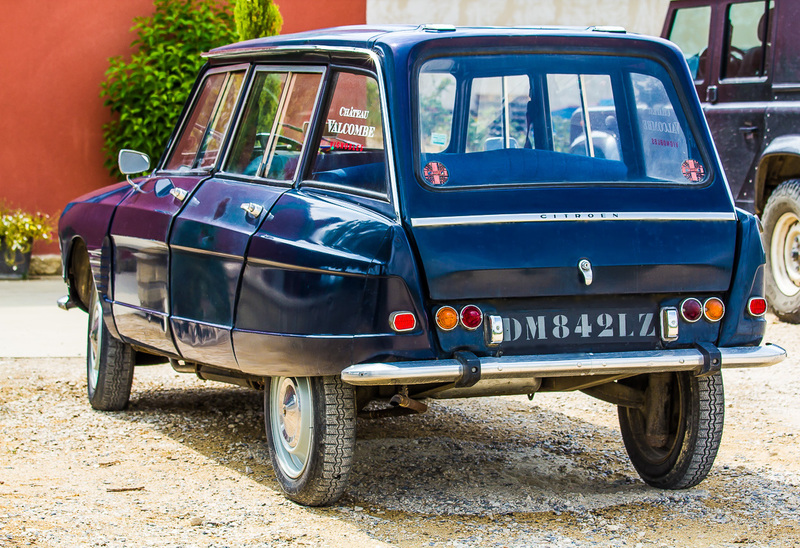 If you like to read more about lovely Citroëns, old and new, I can recommend you to like the facebook page of Fokker Citroën Specialist by clicking here ! 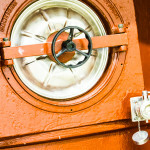 Every day interesting and exciting stories ! Hope you enjoyed reading this article and till next time ! Thank you so much for your quick response ! merci pour ce bel article. Il est tout simplement parfait : tout est dit et les photos sont aussi magnifiques que les explications. Vous avez très bien su retranscrire “nous” dans sa totalité. 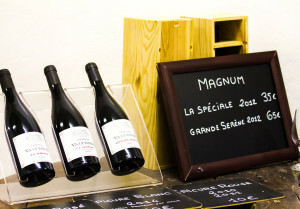 Merci beaucoup et au plaisir de vous retrouver au domaine.